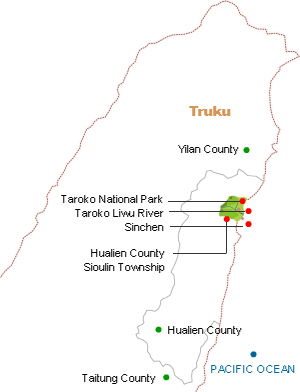 The main settlement area of the Truku or the eastern Sedek is on the eastern side of the Central Range, the catchment area of the Mugua River, the Liwu River, and the Heping River, and it includes the following administrative divisions in Hualien County: Wunlan Village, Tongmen Village, Shueiyuan Village, Jiiamin Village, Jingmei Village, Sioulin Village, Fushih Village, Chongde Village, and Heping Village in the Sioulin Township, and Hongye Village, Mingli Village, Wanrong Village, Jiiancing Village, and Silin Village in Wanrong Township, and Lunshen Village and Lishen Village in Jhuosi Township, and Sikou Village in Shoufong Township, Nan-ao Village, Aohua Village and Jinyang Village in Nan-ao Township, and Cingfong Village, Nanhua Village, and Fusing Village in Jian Township. Most historical records about the ethnic group were written by early missionaries, colonial officers and scholars during the period of Japanese rule (1895-1945), KMT rule and the present. These studies mainly focused on the Atayal, and treated the Truku as a subgroup of the Atayal, so only cultural and linguistic differences between the Truku (i.e. the eastern Sedek) and the Atayal are mentioned, discussed or compared. There is relatively little research focused exclusively on the Truku, but the amount has increased recently. In Truku oral history, there are two versions of their myth of origin; one is known as the “wood born and stone born” version (stating that their ancestors were born in a mythical tree which had both the nature of wood and stone), and another one is known as the endless hole version. In fact, the Tkdaya, the Tuuda and the Truku all have different ideas about their place of origin. Bunobong in the southwest of Wunlan Village in Sioulin Township Hualien County is a more widely accepted place of origin. Researchers also included the group’s oral history when they made written records of the group’s migration history. From the Qing dynasty, through Japanese rule and KMT rule after World War II, the Truku have experienced continuous migration because of warfare among tribes or groups, coercion by the state powers, and due to conditions in the areas where they lived. Generally tribes moved from high mountains to plains regions. In recent years, some Truku people have left their tribes for cities to pursue better lives. Truku society lacks tight organization. When the Truku migrated toward the east, clans were the basic social unit, so all members in the same tribe were bound by kinship ties, and tribes, in turn, were connected by kinship, forming a dense social network. Tribes segmented easily, which usually happened within less than three generations when members moved out to make a new tribe. Therefore, tribes remained very small. In times of emergency, neighboring tribes with kinship ties would band together in tribal coalitions to defend themselves from enemies. There were various roles in Truku society, including the chief (and also a vice chief or deputy chief in bigger tribes), elders, clan leaders, messengers and warriors. But some research shows that tribal leaders were usually nominated by outside dominant forces, so they did not have the same power as kinship leaders. When decisions needed to be made, elders and clan leaders were the decision makers. Kinship plays an important role in Truku society. Tribes are mainly built on this principle. It is also the rule for personal interrelationships. Kinship (lutut) includes both matrilineal and patrilineal ties, as well as affinity. It is a bilateral kinship concept, i.e. emphasizing blood descent rather than gender or marriage. Gaya is a key concept in Truku, and means law, moral, taboo, ritual, custom, regulation, etc. People who are in the same gaya relationship have close kinship and genealogical ties, which is the main method to organize and mobilize tribal members. People of the same gaya take care of each other, help the needy, bear the same punishments, and follow the same orders. The rules of male-female relations are also dictated by gaya. Agriculture is the main livelihood of most Truku people. But some people have left their hometown for urban areas, such as Hualien City, and engaged in business, education or public affairs. Also, many Truku youth have studied in urban areas and developed college organizations, such as the College and Technical School Aboriginal Youth Association. The Taiwanese Aboriginal Truku Student and Youth Association was established in March, 2001, by a group of Truku students in northern Taiwan. Its goal is to promote Truku culture and the ethnic name restoration movement. Except for meetings at this type of student organization, other Truku people who live in the urban areas do not gather in the same locations but live separately, according to their profession. Before state power entered into Truku society, Truku people practiced slash and burn agriculture and hunting as their main production methods. Their living areas were mostly in mountain regions whose elevation exceeded one thousand meters. Food resources included plants, such as millet, dry rice and sweet potatoes, and animal meat from the mountains. Traditional houses and buildings were made by materials taken from the surrounding environment, including wood, bamboo or flagstone. Crops, for example, millet and sweet potatoes, were the staples of their diet, supplemented by wild fruits and vegetables, and animal meat from hunting. Millet was made into sticky cake and porridge, or fermented to make alcoholic beverages. Sweet potatoes were good for steaming, boiling or roasting. Animals were hunted in the mountains, including wild boars, water deer, Formosan Reeves' muntjac, Formosan serow, flying squirrels, masked palm civet and rabbits. Birds or fish were additional food sources. Meat was normally cooked or marinated, but some organs were eaten raw. 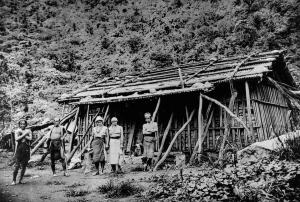 Division of labor in Truku society was based on gender; males took care of hunting and cultivating while females were in charge of weaving and farming. Hunting was the men’s primary responsibility, but heavy agricultural labor such as logging and cleaning fields also fell to them. Women farmed the land and hoed the weeds, but both genders did the harvesting together. They traded with other people for daily necessities which they could not produce; for example, they obtained salt, gun powder, guns, and iron tools from the Han Chinese. The traditional Truku religion is the utux faith. Utux (or rutux, rudan) means “ancestral spirit,” but it also means “god,” “ghost” or “soul.” Even though utux includes all the deceased, only the utux with the same kinship tie are of significance. Therefore, the main goal of utux worship is to offer a sacrifice to ancestral spirits, and the worship is closely related to individual and group members’ fortune. Violating gaya or disrespecting utux will bring misfortune, disaster or misery to the offender or to the other members. Christianity spread throughout the Truku area under Japanese rule (1895-1945). However, the Japanese government banned missionary work, so missionaries were unable to reach all of Taiwan. 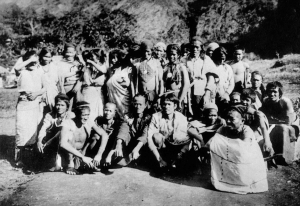 After World War II, the number of converted Truku people increased rapidly, major denominations included Presbyterian, Catholic and True Jesus Church. One of their traditional religious leaders is the priest (msaly gaya), but not all of the priests are professional (in the Truku language group, clan leaders play the role of priest). Priests lead all the production rituals and direct tribal members to follow gaya in the rituals in order to obtain a bountiful harvest, good fortune on hunting expeditions, and success in head-hunting. Female witches (smabox guyox) use sorcery to divine the causes of diseases or disasters. After the conversion to Christianity, the role of religious leaders has been taken by church clergy or church elders who discuss and determine religious affairs. Sometimes they are also crucial figures in political movements; for example, protestant preachers initiated the Truku ethnic name restoration movement in its early stage. Traditional religion includes not only ancestral spirit rituals but also other annual agricultural rituals. The Truku perform a seed sowing ritual and a reaping ritual in accordance with the seasonal cycle of agricultural activities, and a head hunting ritual, rain or sun praying ritual as needed. They perform fewer traditional rituals due to the introduction of Christianity and the change of production method, but some tribes have revived ancestral spirit rituals and other traditional rituals in the recent resurgence of ethnic culture. Traditional Truku tribal size and population are very small; a village usually contains only dozens of residents, while large tribes with more than two hundred people are very rare. Households are scattered widely in a tribe. The minimum distance between households is 20-30 meters, sometimes even several kilometers or several hours walking distance if a tribe has several separate residential areas. Weaving and knitting are substantial handicrafts in traditional life. Weaving is women's work so all of the clothes are hand-made by them. 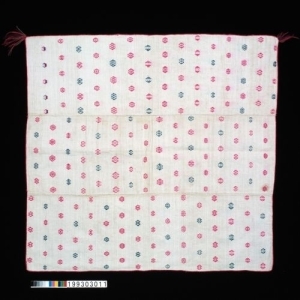 Ramie is the major weaving material, and requires complicated processes of scraping, pounding, heating, and washing before it can be woven, so cotton or wool are now used instead. Knitting materials are usually rattan and bamboo. Nowadays, nylon or other artificial fibers have been used as knitting materials as well. Articles for daily use are knitted and woven in order to carry, hang, store and hold items, and for fishing or decorating. 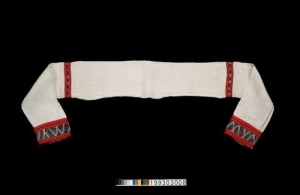 The representative artifacts are net bags, carrying baskets, back baskets or head bands. 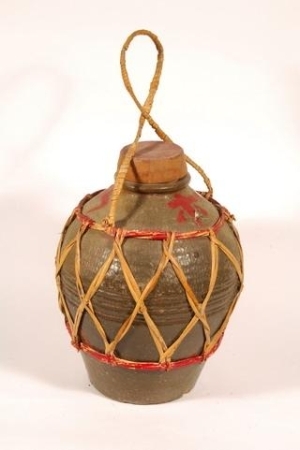 The traditional material culture has now been largely replaced by modern products. Music and dance are two necessary elements of the Truku’s traditional life. No matter whether they are working or relaxing, Truku people, regardless of their gender, like to sing folk songs. Even though they do not have many songs, they can express themselves through improvised lyrics. The dance steps are not complicated, and usually dancers make a circle with simple steps. Musical instruments include the flute and the mouth harp. Recently these instruments have been used more often during performances. In many Taiwanese indigenous cultural parks, aborigines perform dances and songs, which reinforces stereotypes about indigenous people. 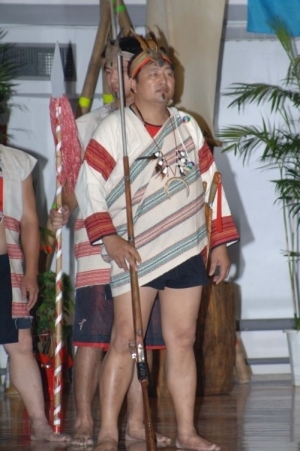 All of the conventional theme parks of indigenous cultures in Hualien present only Amis culture but ignore Truku culture, and Truku people rarely participate in the parks. The Tailuge National Park has harnessed state resources to promote tourism, and Truku people are invited to demonstrate their cloth weaving in the Park and to display traditional household items. Truku people played a part in virtually all of the political indigenous rights movements, such as the “Return Aboriginal Land to Aborigines" movement in 1988, the peaceful protest against Asia Cement in 1990, and the protest against of the Tailuge National Park in 1994. These are some famous cases. Restoring ethnic identity by reclaiming the name of the ethnic group is the main theme of all of these political movements. The ethnic name restoration movement was initiated by the Taiwan presbytery Truku session and attracted the attention of other tribal members after 1996. Many conferences entitled “restoring the name” have been held in Hualien. When the government and society paid more attention to the aboriginal cultures, their culture began to flourish again, as well. Classes teaching aspects of traditional culture, such as weaving and knitting, singing and dancing, and rituals, have been set up in the Truku area. Some Truku people have engaged in all kinds of new artistic creation, such as leather carving. Other people have interviewed the elders and recorded their words, so as to study the Truku culture further. All of these new and traditional activities express the Truku people's identity and eagerness to define their ethnicity and maintain their culture. From the beginning to the end of the ethnic name restoration movement, many cultural and academic activities were held or encouraged, which reveals not only the Truku people’s traditional ethnic identity but also their potential to create a new identity. Both the Truku and Sejiq are faced with a new situation now. They will need to continue to draw upon their wisdom in resolving the ethnic issues of the future.